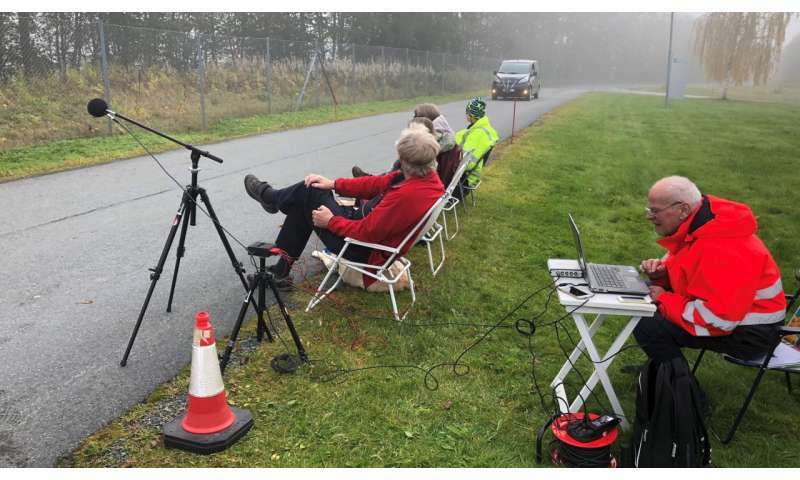 "An electric car must emit an artificially produced sound of varying frequency but fairly constant intensity when travelling at 20 km/h or less," says Truls Berge, an acoustics research scientist at SINTEF. "The new requirements do not take into account the environment in which a vehicle is operating. There is a big difference between the sound needed in a street on a peaceful evening and in a busy urban traffic environment," he says. Berge and his colleagues recently carried out an experiment in which they tested a solution which they have developed themselves. They equipped an electric car to produce a so-called "adaptive sound" and tested this with the help of a number of blind volunteers. The research scientists also used loudspeakers producing different sound levels to simulate background noise in a busy urban street. The concept of "adaptive sound" is that the vehicles can be fitted with microphones which sense the sound level in the surroundings, and the sound the vehicles produce is adapted to suit this ambient sound level. The aim was to find out what level of warning sound was needed under different ambient sound conditions, thereby determining how much sound it is actually necessary to use. "A number of car manufacturers, including Nissan, General Motors and Renault, have shown interest in the results of this project. Norway has the highest density of electric vehicles in the world, so it's natural that electric car manufacturers look to us with regard to traffic safety and research in this field," says Truls Berge at SINTEF. Sighted people also rely on the sounds that cars make, particularly from the tires and engine. If electric cars are silent the answer is simple--fit them with sound-making devices so that they sound more like the older variety! The gold standard for car in sound is the quiescently English Rolls-Royce! No one cares for the deaf. From my perspective, electric cars provide us with a unique opportunity to reduce all the traffic noise, especially from loud mufflers. Now let's all provide a "noise maker" into this opportunity to completely nullify the sound decrease. I understand the plight of the blind in this situation but find it troubling that we should start introducing more noise from otherwise quiet cars. There must be a better solution. The last thing we need is all the traffic to start intentionally "whining" to be heard thus keeping transportation a noisy experience.